Progressive Maryland announced last week its endorsement of state Sen. Roger Manno (D-Silver Spring) in his bid for Maryland’s 6th Congressional District. A Miner Detail shares Manno’s press release announcing the endorsement. Montgomery County, MD – Today Senator Roger Manno, candidate for Maryland’s 6th Congressional District, received the coveted endorsement of Maryland’s preeminent progressive advocacy organization: Progressive Maryland. With more than 100,000 individual members and supporters and 30 affiliated religious, community, and labor organizations, Progressive Maryland focuses on outreach, public education, lobbying, direct political action, research, and helping elect progressive candidates to office. It is also the state affiliate of People’s Action, which has over 50 affiliates in 29 states. The only candidate in the race to vote against the $1.1 BILLION Estate Tax cut for the richest .2 percent of Americans. The only candidate in the race to vote against allowing garbage burners to receive “clean energy” tax credits. The only candidate in the race to vote against Governor Hogan’s #1 priority: a multi-million corporate tax cut that gives nothing to hard-working blue-collar factory workers. 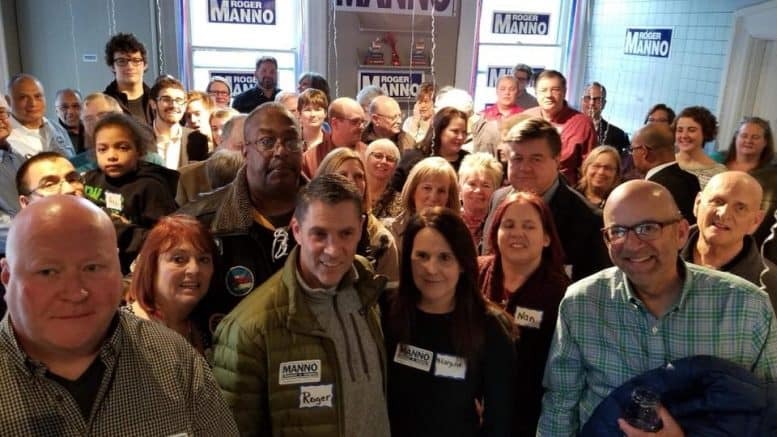 Manno on Saturday opened a campaign office in downtown Hagerstown, welcoming more than 90 people, including Hagerstown City Councilwoman Emily Keller, state Sen. Ron Young (D-Frederick), former Washington County Commissioner Ron Bowers (D), and several local and prominent Democratic officials. Manno isn’t the only Democratic candidate heavily targeting Western Maryland. Total Wine & More co-owner David Trone, a multimillionaire businessman from Potomac who spent more than $13 million on his unsuccessful 2016 Democratic primary bid for Congressional District 8, has also opened a Hagerstown office and has been steadily reaching out to local Democratic officials for support. Trone today is hosting a free opioid “community service meeting” in Cumberland. Trone’s political director, Grace Rivera-Oven, resigned nearly two weeks ago from Trone’s campaign over personal and family reasons, according to a resignation letter the Trone campaign shared with A Miner Detail. Sources familiar with Rivera-Oven’s resignation told A Miner Detail that she was concerned with “misogyny” and “sexism” within the Trone ranks and with David Trone himself. However, Rivera-Oven is said to have left Trone’s campaign because she is gearing up to run for a Montgomery County Council at-large seat. Another source told A Miner Detail that Rivera-Oven was allegedly concerned about racism within the Trone campaign structure. More information about Rivera-Oven’s resignation is expected to drop in the coming weeks. Manno and Trone are both competing heavily in Western Maryland, with Manno working to bolster his credentials among Western Maryland progressives while Trone builds his base of support with municipal officials and business leaders. Washington County Democratic Party Chairman Peter E. Perini, Sr. is publicly backing Trone’s congressional bid, appearing as a key ally for Trone in Washington County. Perini is running for state delegate in District 2B, which encompasses most of the City of Hagerstown and is considered a Democratic stronghold and potential Democratic pickup in 2018. Since launching his congressional bid, Manno has amassed numerous endorsements from leading labor organizations. Manno, however, lags in fundraising, coming in behind Trone and Del. Aruna Miller, who has built a large Montgomery County volunteer base and is considered Trone’s primary competition among Montgomery County Democratic Party insiders. Andrew Duck, a Democrat also running for Maryland’s 6th Congressional District, on Saturday opened a campaign office in downtown Frederick. Duck is competing for the same Western Maryland progressive base that Manno is targeting. Rep. John Delaney (D-Potomac) announced his candidacy for president last July, resulting in a large crowd of candidates running to fill his seat. Four Republicans have launched campaigns: Amie Hoeber, Lisa Lloyd, Kurt Elsasser and Bradley Rohrs. And six Democrats have announced candidacies: Dr. Nadi Hashimi, Andrew Duck, Chris Hearsey, state Sen. Roger Manno (D-Silver Spring), Del. Aruna Miller (D-Darnestown) and David Trone. Sources have told A Miner Detail that another Republican, Ken Timmerman of Frederick, will soon launch his campaign for the 6th Congressional District. Timmerman, a rightwing Trump supporter, lost a congressional bid in 2012 against then-Congressman Chris Van Hollen (D-Md.). The last day to file for public office in Maryland is Feb. 27 at 9:00 p.m.